Planes crashing into the World Trade Towers and the Pentagon brought back memories of kamikaze planes crashing into American ships during World War II. Suicide bombers in Israel and Iraq also sometimes draw comparisons to Japanese kamikaze pilots who made suicide attacks in the waters off the Philippines and Okinawa. Although modern-day terrorist suicide bombings and kamikaze crashes into ships have apparent similarities, the fundamental nature of these attacks differs greatly. After the September 11th attack and in the midst of continuing news of Islamic terrorist suicide bombings, the mass media has at times mentioned Japanese kamikazes in connection with terrorist bombings. For example, ABC News and the Los Angeles Times published articles comparing modern terrorists who carry out suicide bombings to the kamikaze pilots who crashed their planes into American ships. Litke of ABC News writes, "Did WWII kamikaze pilots differ from Palestinian, Al Qaeda killers? It all took place more than a half-century ago, but the images have an eerie similarity to Sept. 11, 2001, as does the shock of those who witnessed the attacks" (Litke 2002). Wallace, a Los Angeles Times reporter, writes about the last letters of kamikaze pilots on display at a Japanese museum, "The letters recall the grainy farewell videos made by departing suicide bombers in the Middle East, posed in front of flags, explosive belts already wired" (Wallace 2004). Kamikaze attacks and terrorist suicide bombings have one essential difference. The Japanese kamikazes directed their attacks at military targets, whereas terrorists kill innocent civilians. The Japanese military leaders decided to use suicide attacks as a battle tactic near the end of World War II in a desperate attempt to stop the steady advance of Allied forces with superior weapons. In June 1944, Japan lost over 400 aircraft in a couple of days in the Battle of the Philippine Sea, also known to Americans as the Great Marianas Turkey Shoot (Tolland 1970, 500-3). Even without engaging in suicide attacks, Japanese pilots flying near the end of the war had a very high probability of death if they tried to drop bombs or torpedoes on American ships. 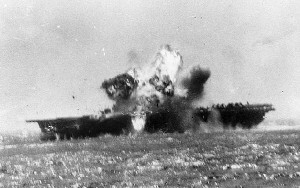 Therefore, if Japanese pilots had to die, certain military leaders and pilots supported the idea of suicide attacks against ships in order to try to cause significant damage to the enemy. In contrast to the kamikaze attacks of World War II, modern Islamic suicide bombings generally target civilians. However, terrorists may have an extremely warped view of the world where they consider all citizens of another country or another religion to be the enemy without distinction between military personnel and civilians. Religious fanaticism is another alleged similarity between Japanese kamikazes and modern-day suicide bombers. Most Islamic suicide bombers seem to have a strong religious motivation, although some Palestinian bombings may be attributed more to political reasons. Many of these bombers believe they will immediately enter Paradise since they consider their deaths to be part of a jihad (holy war) against their enemies. Litke (2002) argues that kamikaze pilots were "fanatically devoted to the emperor, who was considered a god at the time," but he provides little support for his assertion of fanaticism. Based on my own personal interviews with several kamikaze pilots and quotations from surviving pilots interviewed by Wallace (2004), they do not mention this claim of fanatical devotion to the emperor. Instead, they frequently mention that they had a willingness to die in defense of their country and their families, which echoes sentiments expressed by Allied soldiers. Emiko Ohnuki-Tierney, author of a book published in 2002 in which she analyzes letters written by kamikaze pilots, says, "they did not commit suicide for the emperor." She provides the following explanation for their actions, "Their country was in a state of total war, and after agonizing over their situation, many felt they had no choice but to go" (Wallace 2004). Japanese soldiers had a traditional code that they would die with honor rather than face surrender, so most Japanese people considered the participation of kamikaze pilots in suicide attacks in the face of defeat to be honorable and courageous. Journalists and other people sometimes use the word "kamikaze" synonymously with any type of suicide bomber. Former Japanese kamikaze pilots who survived the war deeply resent this linguistic association of modern-day terrorist suicide bombings with the attacks made by kamikaze pilots during World War II. They firmly believe that the battle tactic engaged in by the Japanese kamikaze corps against military targets has nothing in common with the taking of the lives of innocent civilians by Islamic suicide bombers. kamikaze021228.html> (November 7, 2003), link no longer available. Wallace, Bruce. 2004. They've Outlived the Stigma. Los Angeles Times, September 25. <http://www.latimes.com/news/printedition/la-fg-kamikaze25sep25,1,3835906.story> (September 27, 2004), link no longer available.